- sweet are the words of that monk. 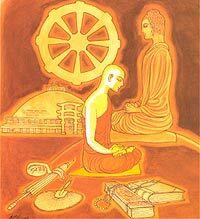 the text of the Dhamma, — sweet are the words of that bhikkhu. two Chief Disciples, the Venerable Sariputta and the Venerable Maha Moggallana. sweet are the words of that bhikkhu. from the Dhamma of the virtuous. mindful of the Dhamma, does not fall away from the Dhamma of the virtuous1. the Dhamma of the virtuous. 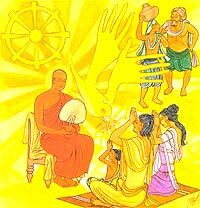 At the end of the discourse Thera Dhammarama attained arahatship. The 13th Sakyadhita International Conference on Buddhist Women will be held in Vaishali (Bihar) India, January 5-12, 2013. Visit the Conference & Tours Details page. Flight and Train schedules and weather for Patna/Vaishali. Download a printable (PDF) registration form to mail. Download the 13th Sakyadhita Conference brochure. Download a partial set of Presentation Abstracts. and get previews of conference presentations on the Events Page. Vaishali possesses an incredibly rich past in the history of Buddhism. the subduing of Nalagiri, the angry elephant, through friendliness. Vaishali was the Place of receiving an offering of honey from a monkey. Vaishali was the capital of the Vajjian Republic of ancient India. Buddhist Council a hundred years after his demise. and Sahara Air also connect Patna with various cities in India. Regular bus services connect the city of Patna with Ranchi and Siliguri. local transport include cars, auto rickshaw and rickshaws. and Varanasi as well as other important Indian cities and towns. Return to this page in the coming months for updates and Conference details.